As part of the new year, I made a resolution to share my classroom on Twitter this year. I feel one of the roles of a teacher is to communicate with the community that they serve. Over the past two weeks, I have tried to tweet at least once every day about the nature of the lesson or progress towards a goal. The first positive result of my efforts to tweet has been connecting with other teachers and getting new ideas. 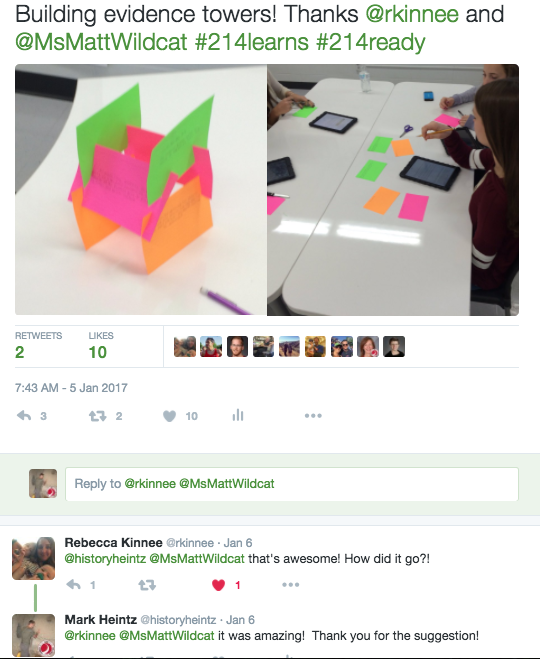 A few weeks ago, our school Periscoped a few classrooms to share a live feed of daily classroom learning. You can read about that here. I received some feedback on the lesson and changed my plan the next day to incorporate their ideas about including argument towers to improve student writing. I thanked them for the suggestion on Twitter. It was great to get new ideas and share the results! It was a positive affirmation of my efforts to share what was happening in the classroom. Finally, the first few days of the new year, the pictures in my tweets largely came from my first period class. A student in my second hour said I was unfairly biased towards my first period. He was right, so I now engage with all of my classes throughout the day. The students are interested in what I share and how I share it. They are turning into historians! It has been a great start, and I can't wait to see future outcomes!